A close-up image showing the flash flood at Padang Merdeka area on Jan 8 this year. 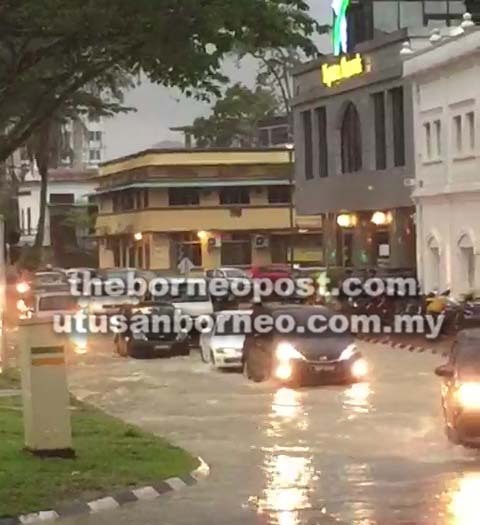 KUCHING: The Kuching North City Commission (DBKU) is asked to explain why flash flood still occurs at Padang Merdeka area here after millions of ringgit had been spent on improving the drainage there. Pending assemblywoman Violet Yong in seeking an explanation on the issue pointed to a news report dated Dec 5, 2017 which said the commission had spent RM8.5 million to address flooding in the city centre. “The Padang Merdeka area still gets flash flood during heavy downpour, causing massive traffic jam and inconvenience to road users and commercial owners there,” she said at a news conference here yesterday. Yong said DBKU had been quoted in the report as saying that three phases of works had been carried out and the cost totalled RM8.5 million. She then queried why the flash flood problem persisted after having spent such an amount. “According to the report, all the three phases were completed by March last year. You (DBKU) have spent taxpayers’ money and the project is not effective. “DBKU has to explain why it failed to solve the problem. We cannot allow the state agency and the state government under GPS (Gabungan Parti Sarawak) to simply spend our taxpayers’ money,” she said. Yong asserted that taxpayers’ money should be channelled to benefit the people in general. Moreover, she said the affected area is where tourists usually hang around and the flash floods would tarnish the image of the city. During the press conference, Yong shared an image provided by a member of the public taken on Jan 8 this year showing a road next to Padang Merdeka submerged by rainwater. According to Yong, the most recent flash flood incidents in the said area were on Jan 8 this year and Nov 23 last year. “DBKU has even proudly announced that the problem will be solved. We would like to ask DBKU to explain. “GPS has to be serious and prudent in spending people’s money, no matter how much resources we have,” she said.